The AIM Pneumatic Separator or Airleg cleans and classifies products in a wide range of sizes and weights, separating them into two groups with a uniform column of air. 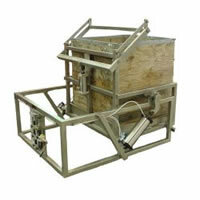 Our airleg is simple, inexpensive to install, straightforward to operate and easy to maintain. Its superior design guarantees optimum efficiency and productivity. 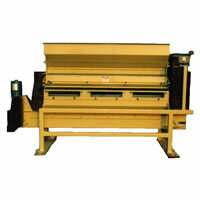 It is used for precise finish sorting, high volume scalping or pre-cleaning operations. 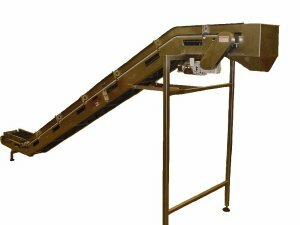 The AIM Cascade Pneumatic Separator, or Cascade Airleg, provides high efficiency cleaning and separating for scores of agricultural and industrial products. The Cascade Airleg combines two separators in a single unit with a simple and efficient design. Because the unit can be set for two different air flow settings at once, it is possible to achieve three separations with one machine in a single pass. The Cascade Airleg can also be custom designed to accommodate four separations simultaneously. The AIM Pinsorter is an inclined revolving cylinder lined with needles which sweeps though the product. The product is fed into the cylinder and moves by the drum rotation and gravity along the bottom towards the discharge end. Any product with holes, cracks, chips or splits are caught by the needles and taken to the top of the cylinder where it is brushed off into a collecting chute or conveyor. 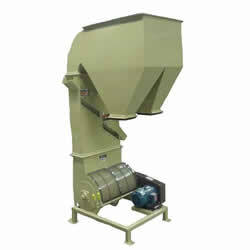 The AIM B&B Friction Separator with its rotating serrated drum and adjustable brush sorts products by their texture. The separation is achieved by the smooth product being gently pushed back on the serrated drum while the rough clods, splits, and other rough foreign material are pulled through the brush. The separation is not based on product density. The AIM Roller Sizer is a diverging, counter rotating roller system. Product is moved along sloping rollers that allow fractional sizing by dropping it, between the adjustable roller, into individual chutes. The Roller Sizer sorts a product based on its thickness (see diagram). 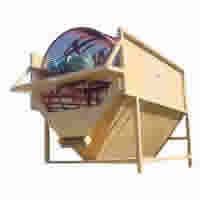 A typical vibratory screen, with round or square holes, sorts on the first size or width. The Roller Sizer sorts the size or thickness. The AIM Bean Polisher with polishing unit, HI-VIB screener, aspirator and circulating conveyors is a complete unit for polishing. The polishing unit consists of a series of paddles (on a horizontal shaft) arranged to cause a propelling and repelling action. The propelling action, being the greatest, cause the product to move forward and scrub over a polishing medium, usually sawdust, which produces a high polish. The media is removed from the product on an inclined HI-VIB screen tray, discharging the polished product into an aspirator. The aspirator removes splits and other light material leaving your product ready to package. 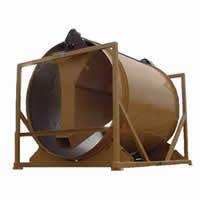 The AIM Bin Dumper is designed for reliable unloading of boxes, bins, crates, and other containers. 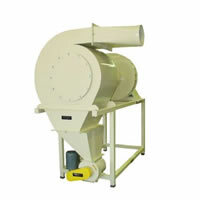 Our bin dumper will allow your facility to effectively introduce bulk product into the production process. 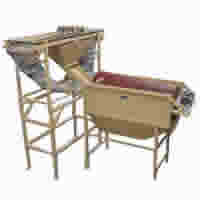 The frame is constructed of square mild steel tube and we will customize the hopper size to meet your needs. 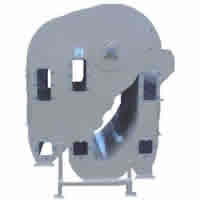 Stainless steel construction, for part or all, of the unit is also available. Our bin dumper can be actuated by hydraulics or electrically to suit your requirements. 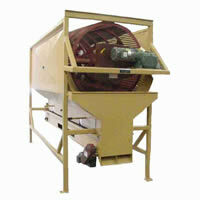 The AIM Horizontal Cyclone removes dust and other light material from your scalping/cleaning processes. Our cyclone will efficiently separate particulate while reducing cost and offering a reliable, low maintenance operation. The simple design incorporates a round, symmetrical shape with smooth interior surfaces to provide excellent separation and ease of operation. The AIM ERA separator will mitigate cleaning problems associated with dry products which are prone to producing dust contamination in the work environment. The ERA units continually recirculate air under positive pressure for more consistent air flows through the product mixture, lifting the light materials and discharging them into the settling chamber. The AIM Rotary Sizer is a rotating cage with round rods precisely spaced around the cage. The standard unit has three sections plus the “over” size. In a pecan hulling operation, the sizer is used to bypass the smaller hulled nuts from the larger in-hull nuts sending them onto the brush hullers. 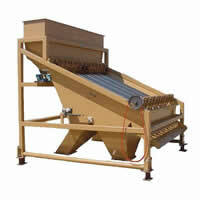 A divided conveyor with flip gates is used to direct the nuts to the next cleaning process. The AIM Trash Cage is a rotating cage with square bars precisely position (usually spaced with 1/2″ to 5/8″ gap) for the removal of fine material. They are commonly used prior to hulling to remove sand, small dirt, stones and loose hull. After hulling they remove the hull loosened by the huller. The square bar agitates the product for improved separation. The AIM Chain Sizer is a single size sorter for high capacity “rough” sorting. The chain is sized to let smaller material pass through, while allowing larger material to “ride” the chain. 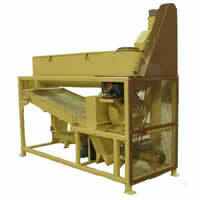 This design can be used to provide a variety of sorting capabilities. Rubber rods aid in stirring the product and a rotating cam shaft agitates the chain to aid in product separation. 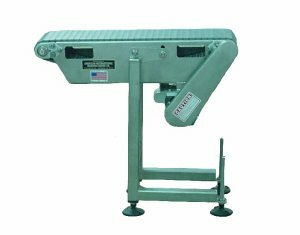 American International Manufacturing specializes in producing many different types of conveyors. AIM can produce a conveyor of any width and length to fit your personal needs. 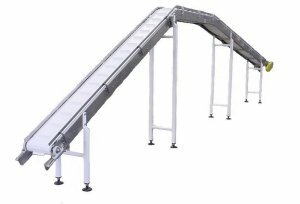 All of our conveyors can also be made with sanitary stainless steel construction for food products. A.I.M. has a complete engineering and design division. This division features drafting and design with the Auto Cad system along with Post Processing Machine Programming and automation with MTC Pipe/Ducting system.